From beneath his coach, certified RV technician and journalist Chris Dougherty shows you how a blown tire could ignite an RV’s propane if the propane tank is still turned on. How do you avoid this happening? Chris has the answer. Chris was the technical editor of RVtravel.com when this video was made. He has since become the technical editor for Trailer Life and Motorhome magazines. There is a far greater risk of an engine fire or a fire started from wheel bearings & hubs overheating. What should we do? Just stay home? Asking for a friend. BS. They manufacture these fridges to operate while in motion. 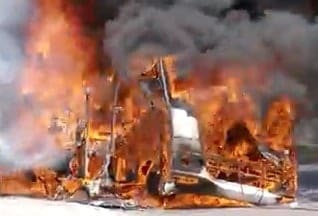 Propane shuts down if ruptured..if your worried about blowouts then don’t put your rv in motion because that tire can total out the whole rv or cause a crash. Weigh your tolerance to risk and enjoy all the convenience’s your rv has to offer. Please provide all the stats that show that there is even a problem of propane or fridge fires while traveling down the road. I’ll wait. Does this mean turn the propane off at the fill valve or on the inside switch? The big word here, at the 1:00 mark on the video is “IF”. IF the dog didn’t stop to take a dump he would have won the race. Should too much propane escape the valve in the propane tank will shut off automatically. Let me ask “Your gas tank on your car is right beside your rear tire. Heaven forbid you should have a blow out on a rear tire. BOOM. Safety first – park your car and don’t go anywhere. We never travel with propane on even tho we have metal lines under the coach. In the event of an accident, blown tire or an impact with a road object – Walla – Statistic! We do freeze the blue freeze bottles and place them in the refrigerator – normally good for about 4-5 hours of travel – except maybe ice cream! No travel need for propane! It is an explosive as a liquid or gas! Feelin’ lucky – leave it on! Traveling in Texas I blew a tire and unknowingly the tire broke the gas line where my grill plugged in. Never knew it until the refer started warming up. The valve in my tank must have worked because I never smelt gas. I still travel with gas on and refer on. I never see anyone discussing the automatic cutoff valve that have been installed in rv’s for years. If a line should puncture the flow would increase causing the cutoff to shut off the flow of propane. I am not saying there would not be a flare if the propane ignites but it would cut off pretty quickly. We always turn the propane off, AND the fridge as well. Never have a problem with stuff going bad or warming up. Just don’t open the fridge as you travel. Oh, and our propane line under the trailer is a metal pipe. Good thinking, however; all my propane lines are 5 feet in front of my tires. I don’t have that problem. I recently read a poll on one of the RV forums I read. The question was “Do you travel with your propane on?” or similar verbiage. I don’t want to say that 50% responded “yes” but as I recall a large percentage did. MUST keep the beer cold I guess. Then how do u keep your Frozen food and cold food at proper safe temp as u r traveling 4-5 hrs ?. Our Norcold refrig/ freezer auto switches to LP when not on shore power. I travel for 7+ hours with my fridge turned completely off in the heat of summer. I have been doing this in my current trailer for 5 years…60+ trips. As long as the fridge is relatively full with food…and especially the freezer…I have never even had ice cream melt. I usually have a small bag of ice cubes in the freezer for drinks…which never melted one bit either…and it helps keep the freezer and fridge cold. I have a standard Norcold RV fridge in a Primetime 5th wheel toy hauler. See the reply above from me! I just think it’s plain common sense not to drive while it’s on. I DO Not need propane for my FRIDGE, since it is a residential Fridge. However, I make a NOTE TO MYSELF and put it on the Electronics compartment to remind me to turn off the propane before moving out down the road!